Being a demonstrator or presenter at an International Preservation Trades Workshop is a great way to share your skills and knowledge and increase your visibility as a leader in the preservation trades. Demonstrators should have a strong background in the traditional building trades, as well as the ability to convey their techniques and skills in a way that highlights the diversity, vitality and relevance of the traditional trades and contributes to their understanding and practice. The IPTW is an interdisciplinary event designed to attract participants of many backgrounds, ages and skill levels including tradespeople, allied disciplines, students and interested members of the public. The 19th Annual International Preservation Trades Workshop will be held at the Coach Barn at the Shelburne Farm in Burlington, VT on July 22-24th, 2015 with a set-up day on July 21st. This outstanding venue will feature covered areas for most demonstrations and is located on the shore of Lake Champlain. In addition to the outstanding skills from around the country we will be showcasing New England artisans and helping them connect to the wider network of preservation professionals. Setup will be on Tuesday July 21st and demonstrations will be held on Wednesday, July 22nd through Friday the 24th. This year we will have a total of 10 sessions with approximately 7 tracks covering masonry, plaster windows and doors, joinery, carpentry and timber framing, roofing, metal work, decorative finishes and business. You will need to demonstrate at least twice and will have the option to specify your preference if desired though we cannot guarantee a particular slot until the demonstrator schedule is finalized. All demonstrations must break down and be clear of the venue prior to the Friday evening dinner and auction. Full details will be provided in the course of your acceptance. 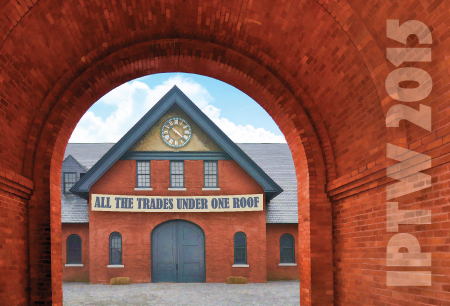 IPTW 2015 - "All the Trades Under One Roof"